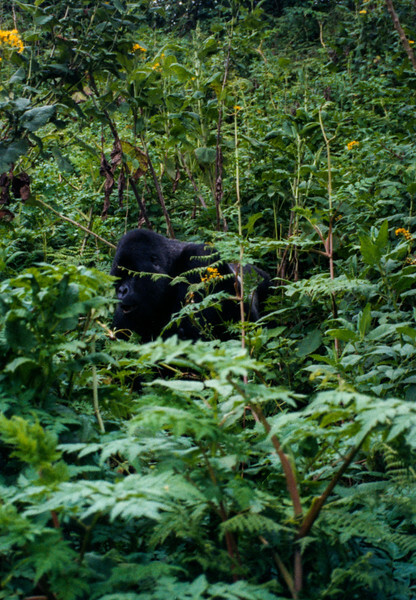 I’m in Rwanda, somewhere in the Virunga Mountains, high up in the Parc National Des Volcans, crouching among half-crushed bushes and bamboo stalks, exercising every ounce of self-control I have. Not to ignore the sticks poking into my behind, nor the tickle of unknown bugs creeping under my clothes – but rather to avoid embarrassing myself by bursting into uncontrollable tears. There’s Mountain Gorillas all around us. And then three meters in front of me. Right. There. A Silverback. And he’s… well, he’s beautiful. Hunch down in the bamboo, the guide had told us. Stay very still, they’d said. Make these gentle grunts to signal you’re not a threat. The babies might come towards you, but don’t touch them – it’s a test, to see if you can be trusted. And whatever you do, no matter what it costs you, don’t look that mountainous and terrifying Silverback in the eye. He’s the Army, Navy and Airforce, all rolled into one 600lb lump of black and grey furry concrete. He’ll defend his family group to the death. And he snaps wrist-sized stalks of bamboo like they were pretzels. Nobody gets past him. No-one visits the family until he gives his approval. The final arbiter and the ultimate enforcer. And yet, he sits there peacefully; calm and unconcerned with our presence, eating breakfast as though he were, well, just eating breakfast. His dark, clearly intelligent gaze brushes over us from time to time. We are being observed even as we observe. It’s impossible not to think about these things when in the presence of a creature like this. 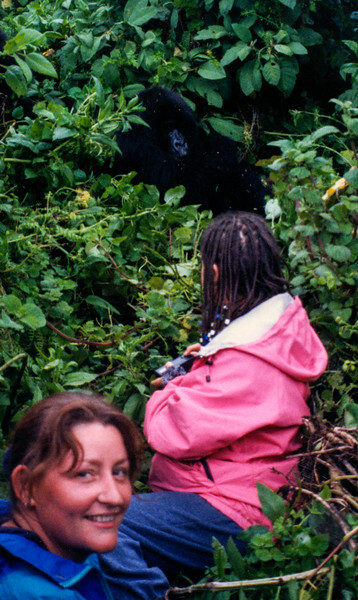 Even before we’d crossed the border from Uganda, the topic of whether it was in the gorillas’ best interests to visit them had worked its way through our group. 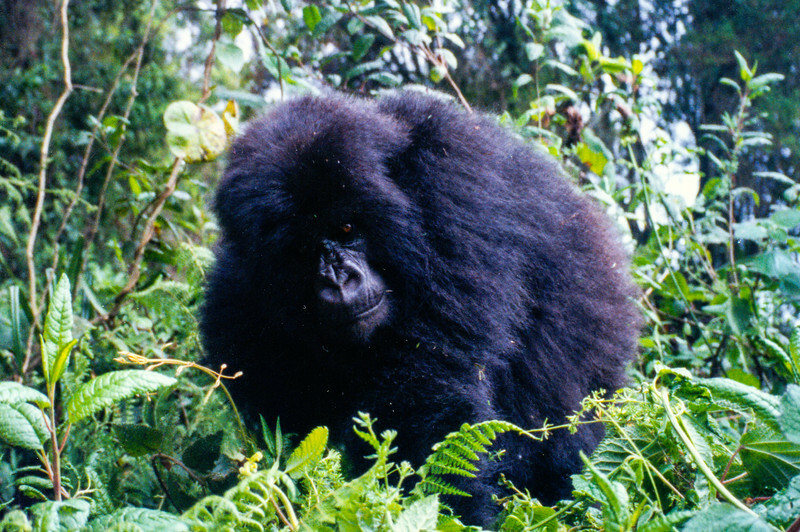 Some travellers are wholly against it, as was these animals’ greatest advocate, Dian Fossey. Fossey’s central passion was the protection of the Mountain Gorillas, and she felt tourism risked their natural habitat – already under threat from potato farmers and cattle herds – and brought potentially lethal diseases into family groups that had no immunity to them. Her work, tireless campaigning, research and especially the book, Gorillas in the Mist, brought the plight of these amazing creatures to the attention of the world. 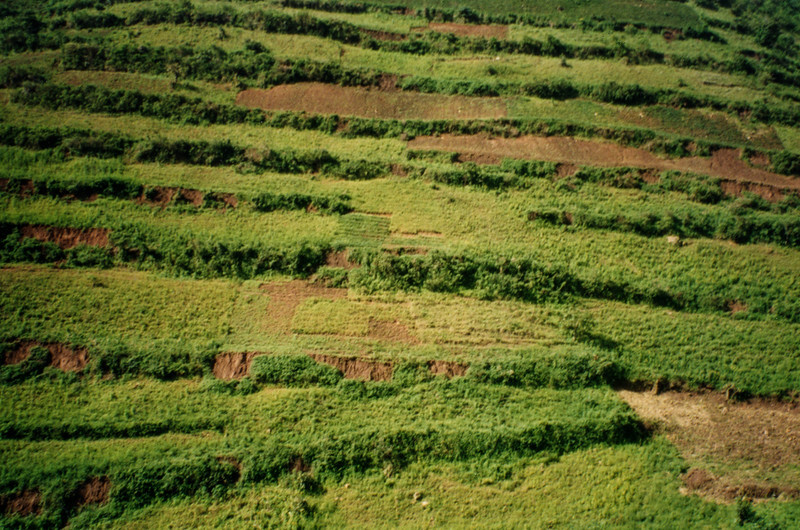 Over time, those threats have diminished, although whether the Mountain Gorillas will survive extinction still remains to be seen. There’s a crack to our left, and an older female gorilla ambles past us to take a place among the bamboo. 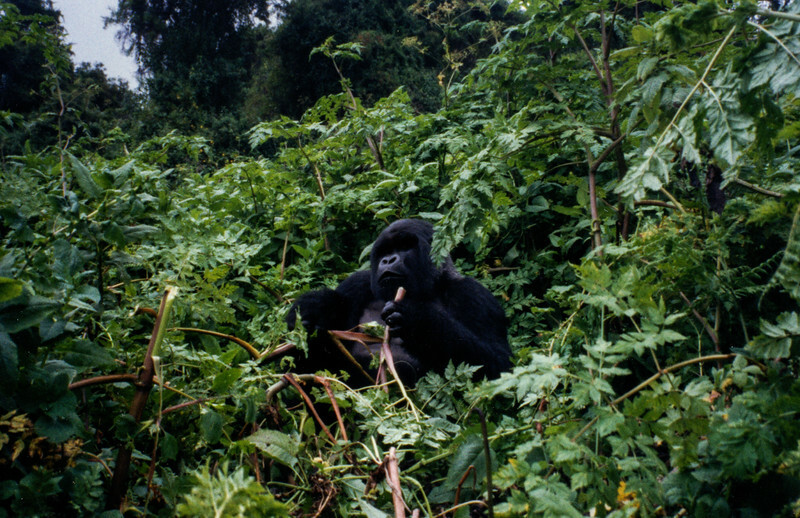 She proceeds to eat, much like the Silverback – in a leisurely manner, choosing her stalks like potato chips from a bowl. If our presence bothers either of them, there’s no sign of it. Dian Fossey used her experience working with children to understand that to gain the trust of the Mountain Gorillas, she had to speak their body language, mimic their grunts – which have specific meanings – and above all, demonstrate deference and respect to the Silverback. It took her many years to gain acceptance and respect in return. We only have the one, solitary hour in which to gather a lifetime’s experiences. It’s both monumental and not enough at the same time. He sits there on sentry duty, munching his bamboo. We crouch just feet away, huddled in a group. Carefully, we raise our cameras, take a few rapid photos until his stare returns to us, and then we all do the “Dian” – drop our gazes and adopt a totally submissive pose until we risk another tiny glance up – to find he’s looked away again. It’s like a carefully choreographed ballet that I would giggle at under other circumstances. Every now and then he stops eating – we all freeze – and only relax again when he starts to munch once more. We look exactly like acolytes kneeling before a god. It’s maybe about ten minutes when, without warning, the Silverback just gets up and lumbers away: we have his approval. Or he’s just full from breakfast – it’s hard to tell. Either way, we carefully move towards the female; bent-over brush and half-chewed bamboo is very unsteady to walk on, like a huge springy mattress with foot-sized holes. She has a baby with her and my heart catches in my throat (something I’d thought was a cliché until this moment). I sit down in front of her, look into her eyes and speak to her. She just looks back at me, impassive, unworried, but almost as if she knows that my noises are an attempt to communicate. Yes, I know how silly that sounds. Much is made of the percentage of DNA we share with these creatures, but it doesn’t take science to see it with your own eyes. There is intelligence behind those steady gazes, thoughts we can occasionally identify, behaviours and attitudes we humans share. They are our cousins, and we are theirs. It’s never more obvious than when you’re in their presence. The guides gently move us on. There’s lots more to see. Higher into the forest and the trees are about 15 meters tall. We hear screeches from above; a couple of gorillas are playing in the canopy, showering us with leaves. We stop before another mother and baby. This little one is really curious and gets to within six inches of Jane’s face before she can move back. We’re shepherded through the forest as we stop and look at four seated gorillas. Two more are in the trees above us. One, a dark blur obscured by vivid green, moves too quickly and we can’t get out of the way in time. A crack splits the air and the branch, gorilla and a cloud of leaves crash at our feet with a thud. Uninjured, the gorilla scampers back up what remains of the tree. We’re left with hearts pounding, gulping back the momentary terror of being crushed by a huge adult gorilla. There’s a lot of playing among them. It’s rough and tumble, fast-paced and full of screeching. The violence is only pretend, but in its shadow is the reality that these animals are still forced to defend themselves against their only predator: humans. Poachers. Terrified and exhilarated at the same time, I look to the guide. He motions for me to squat down beside her. I move deliberately, careful not to scare her. As soon as I’m down, she reaches an arm behind me and pats me on the back about twelve times – but this is no gentle caress. Instead, each pat is an open-palm thump, solid but not painful. Before I could even get my camera out – she moves off a little, to sit amongst the bamboo and watch me. I’m stunned. My heart is thumping so hard I’m sure she can hear it. She was so quiet and gentle. The guide murmurs that it means that she really likes me a lot, that it’s very rare for a gorilla to do something like that. He’s a little shocked. Me too. And yes, a little bit in love. I can’t tell if she’s the same one I spoke to earlier, but it doesn’t matter. Her serious brown eyes regard me with a kind of acceptance I’m not sure I’ve ever experienced from my own species. It’s a moment I’m never going to forget. We move further into the night nest – an area the family group chooses and lives in for about 36 hours before moving on again. We perch on a hillock surrounded by trees and jungle; one amazed little group taking photos, carefully pointing out things and whispering softly to each other. 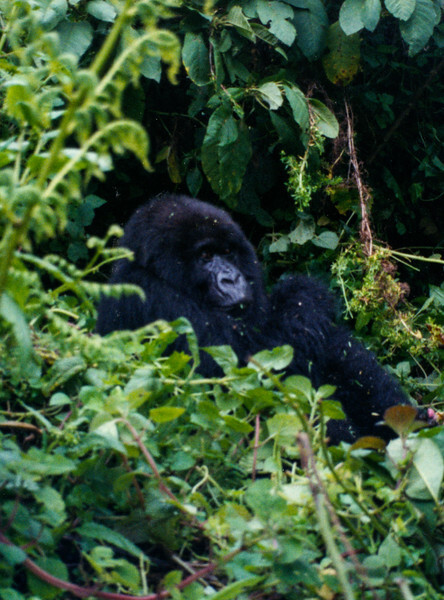 There are about fifteen gorillas all around us – most paying us no attention at all. The younger ones are playing, tossing each other around like they were made of rubber. Others are picking at food, eating, or grooming each other. I can see the alpha Silverback sitting and eating, but obviously also keeping a close eye on us. We’d been warned that we might have to leave at a moment’s notice; if the Silverback changed his mind, then that was the end of our visit, no matter what. Two younger gorillas are very playful and keep running around us, forcing us to scramble out of the way. Jane and Vern are across the clearing when an older female comes out of nowhere, knocking Vern over and grabbing Jane’s arm. She’s dragged about six feet, but one the guides, like lightening, grabs hold of her other arm. There’s a tug of war, and my imagination keeps hearing bones breaking – but moments later, she’s released unharmed. They were just playing. How are they to know we aren’t as tough and unbreakable as them? The mood calms again. We’re just watching the gorillas, occasionally whispering or pointing to something with small signals. Coming from a family of bold statements, huge gestures and dramatic stances, this enforced minimalizing of my self is strangely comfortable. Branches and leaves rustle urgently to my left, and we all look – to see (wince) the younger Silverback coupling with one of the females. It’s one of those moments when you know you should look away, but can’t. Or maybe you shouldn’t look away, but do. Either way, I couldn’t help laughing at the absurdity – but really softly and only to myself. The guards are armed with rifles. We’re never told whether it’s for our protection or the gorillas’. There are about six or seven of them, spread out around the night nest, never too far away. They’re local men, paid a decent wage thanks to foundations such as the one Dian Fossey began. Although their job is different to that of the Guides, they clearly share a connection with the animals. Their eyes sparkle when the gorillas play, or gaze with affection when a baby appears. Providing this protection – even though it can be a dangerous occupation – is not just a job for them, but a labour of love, too. It’s clear that both guards and guides are well known to the gorillas, and completely accepted and trusted. Obviously the novelty of being close to these animals never wears off. Or for that matter, the novelty of the visiting humans to the gorillas. I can’t help wondering why the gorillas allow our visits. We don’t bring food, or offer anything in return, so there’s no physical benefit for the gorillas. And yet, they happily allow us into their nest, trusting their Silverback to keep them safe from us. But there’s more to it than that. Just as we’re interested in them, they’re interested in us. To them, we’re bald, skinny, unplayful cousins who are largely shaped like they are. We don’t do much, but we’re interesting nonetheless. And yes, I’m guessing about all this – but the fact is, if they didn’t want us there, we’d know about it. A sudden crash through the brush behind us and a flash of black and silver sends fear scuttling through me. 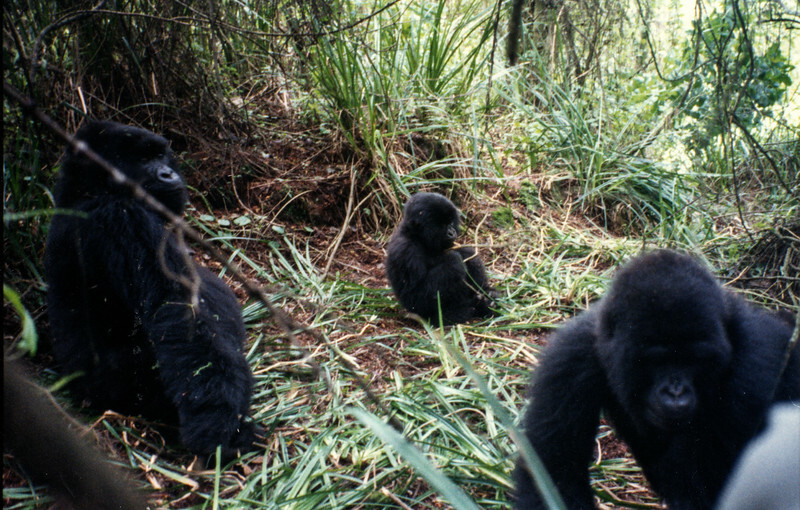 The young silverback gallops across the clearing to where Roger and Lily are sitting. The Silverback grabs Roger, lifts him bodily over Lily and drags him along the ground like a sack of sweet potatoes. A fast-thinking guide steps in, gives the Silverback a whack on the shoulder – and Roger is thankfully set free. The Silverback stands on all fours facing the guide – and the guard just wags a finger at him and smiles. He tells us that the whole thing was just an affectionate pat and that the apparent attack actually meant that the young Silverback liked Roger! For his part, Roger was mostly unhurt, but would definitely end up with some bruises – one of them distinctly hand-shaped. The other gorillas appeared utterly unbothered by the kerfuffle, which helped me calm down, too. They played as usual, but the alpha Silverback was hovering close by, about four foot from where I was crouched. A few minutes later the guides ask us to take our last photos. Then suddenly we’re on our way back through the jungle, clambering through the crushed bamboo to firm ground, following the path we’d taken only an hour before. Stinging nettles are everywhere, leaving barbs all over my knees, right through my pants, and every possible available stretch of flesh. I end up walking with my hands in the air, rather comically, like a holdup victim. It’s a terrible wrench to leave the gorillas. The hour we’d had with them was way too short and yet also feels like it lasted a whole day. That sense of timelessness follows me all the way back through the jungle until we break into the open, where sun-drenched potato fields encroach on the gorillas’ habitat. We sit among the tilled rows and eat our lunch, gazing out at the hills, green-covered and a little less mysterious than they were when we woke this morning. It’s quiet. In soft-voiced reverence, we swap our individual experiences. None of us, no matter our background or temperament, are untouched by our experience. Or unchanged. When it’s time to head downhill to our truck and the long, bumpy road back to Rhuengeri, I do something I’ve never done before: I run, laughing, no longer able to contain that deep well of emotion, of exhilaration. Without guiding, my feet find solid footing, my lungs pull in air, and for a moment – a brief, thrilling moment – I feel as tall, as powerful and as invulnerable as a Mountain Gorilla at play. And maybe that is why they let us stay.